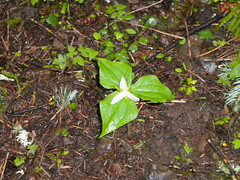 We have made some wonderful spring nature trips in Oregon this year. 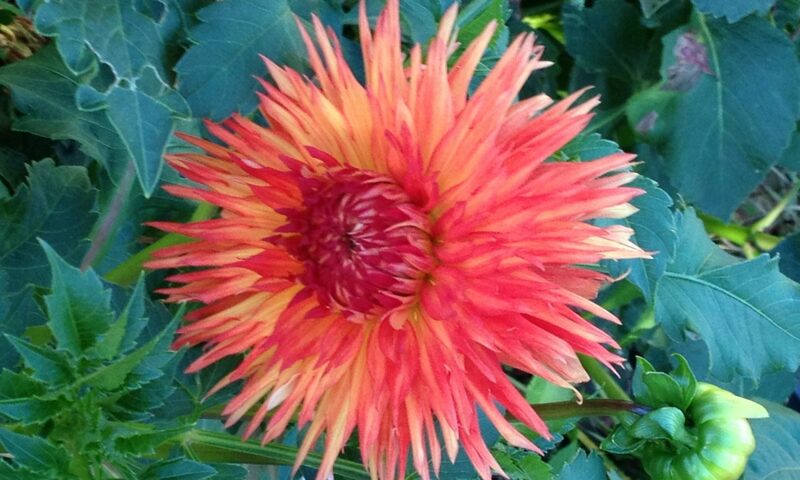 Living in the Willamette Valley, we have easy access to many wonderful places and lots of natural beauty as well as planned gardens. I wanted to show you some of these. They are always such an inspiration for me in thinking about what I would like in my own garden and landscape. 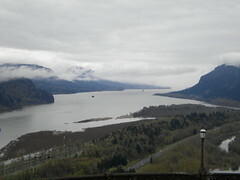 The first of these was earlier in the spring around April when we took a trip up the Columbia Gorge. 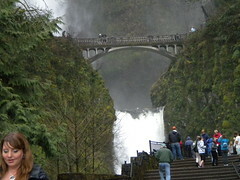 Driving from Portland, along the Columbia Gorge, we went as far as Multnomah Falls. 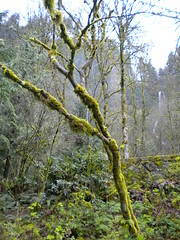 Multnomah Falls itself, with its moss covered cliffs and the incredible bridge. In all this is a wonderful trip. And it was only a short distance from my home. Our second trip was to the beach we stayed in two different locations. 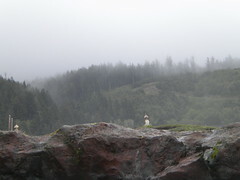 The first of which we were situated beneath some tree covered hills, with fog reaching over them. 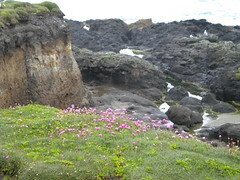 Rocky cliffs were covered with armeria and seagulls nested in the background. I don’t believe that the armeria was there naturally, but it certainly had naturalized well. 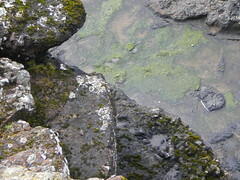 Lichen covered rocks dotted the shoreline. 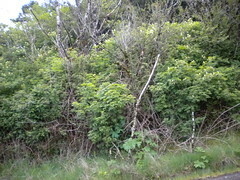 Driving home we saw lots of wild elderberry that was in bloom. 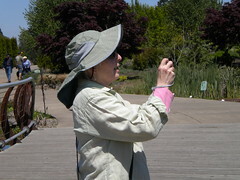 Our next trip was to the Oregon Garden which is in the Willamette Valley, only a 30 min. drive from where I live. I love the Oregon Garden. They have done a wonderful job with very nice display gardens, as well as gardens that have a more natural look. 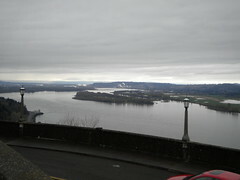 For some reason most of my pictures did not take on my camera, so I have only a couple of them to show you. The ones I have are near a water garden. 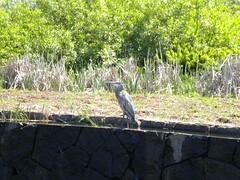 I ended up getting a really nice picture of a Blue Heron. 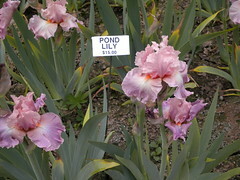 Our last trip was to Schreiners Gardens iris farm in Keizer Oregon, only a 15 minute drive. They have one of the nicest display gardens I have seen anywhere. 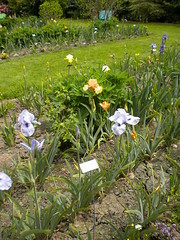 Because of our cool spring this year, there weren’t as many irises in bloom at this time of year as usual. I don’t have many pictures because of this. Schreiners is one of the places that let’s me feed my iris fetish. So many irises, so little time. Well, those are my little trips around north western Oregon. Seeing both natural settings and planned gardens is always an inspiration to me in my home gardening and landscaping. Hope it is for you too.